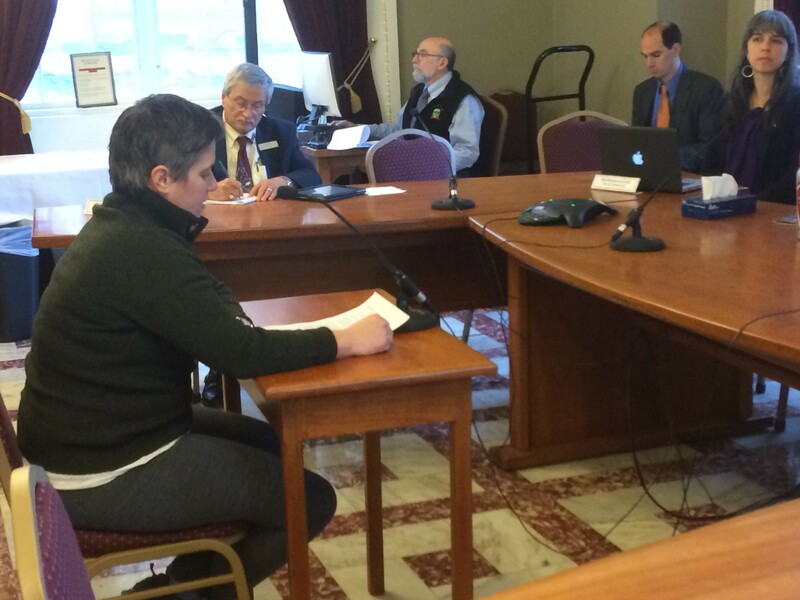 Sue Bette, owner of Bluebird Barbecue, testifies in support of a bill that would prohibit employers from requiring a job applicant to disclose a criminal record. Gov. Peter Shumlin used an executive order last spring to remove questions about criminal records from applications for state jobs, thereby giving all applicants a fair chance of being considered for employment openings. Now the House Committee on General, Housing & Military Affairs is considering a bill that would ban private employers from requiring job applicants to disclose their criminal history on the initial job application. The bill would allow employers to query applicants later in the process, such as during interviews. That approach would let applicants explain their records and possibly provide character references. Rep. Jean O’Sullivan (D-Burlington), the bill’s lead sponsor, said seven other states already prohibit private employers from requiring that job seekers check a box on their applications if they have criminal records. The committee also heard from Jim Harrison, president of the Vermont Retail & Grocers Association. He said many employers have already discontinued asking about criminal records on their applications. But his association would prefer to see education to persuade more employers to abandon their use of a criminal-record check box, rather than a mandate to eliminate the box. If the committee does decide to eliminate the box, Harrison suggested that the bill include an exemption allowing disclosure of criminal records for those applying for positions involving money and credit card information. Rep. Tom Stevens (D-Waterbury) asked if that would include cashier positions. Harrison said yes. Harrison also asked lawmakers to delay the start of the ban until July 1, 2017 because food establishments already face several new obligations: the start of the genetically modified food labeling law this summer and paid sick leave next January. She noted that corrections and the state police received waivers. They can ask questions about criminal records upfront, she said, because that information is pertinent to their work. The state still asks applicants to fill out a criminal history form – but later in the process, Spellman said. The state also checks to make sure job applicants are current with their taxes — a requirement for all state jobs. The state receives about 80,000 job applications a year for 800 to 1,000 openings, Spellman said. Richard Gagné, program manager for Dismas of Vermont —which helps former prisoners reenter society — said many of the 800 men and women who have lived in Dismas houses in Burlington and Winooski in the past three decades felt they lost any chance of being considered for jobs when they checked the box indicating they had criminal records. But he added that many employers in the Burlington area have been willing to take a chance with workers with records. T.J. Donovan, Chittenden County State's Attorney, urged passage of a “ban the box” bill because he said jobs were critical when people are rebuilding their lives after running afoul of the law. The committee has scheduled three more hours of testimony on the bill Thursday and a vote Friday.